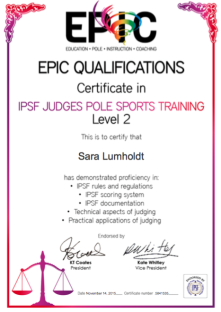 I am a certified Pole sports judge thru the IPSF, I have taken 4 examinations (2014, 2015/2016 & 2017 & 2018) and also judged the World Championship in London 2016. 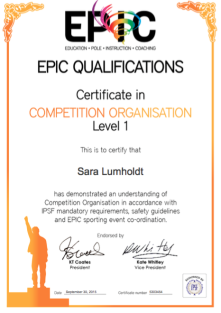 I have also taken their Event coordination course both in 2015 and 2017. I have also done the Pole Theatre Judge Cerification in 2018. 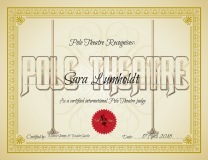 During the competition year i judged the Finnish Nationals in Pole. feb 2018.